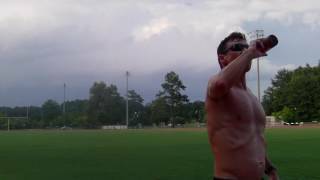 2 Greg Brown 7:09.7	 M 43 Budweiser Impressive first beer mile performance. 5 Sheldon Fowler 15:00.3	 F 43 Budweiser State super master female record! 6 Jeff Baxter 17:09.7	 M 35 Budweiser Threw up twice, ran penalty lap. 7 Caitlin Ranson 17:11.4	 F 26 Heineken Threw up 3 meters before finish line, ran penalty lap. 8 Ashley Crapps 19:47.2	 F 28 Budweiser Threw up, ran penalty lap.